A solution of lead-fluosilicate, containing an excess of fluosilicic acid, has been found to work very satisfactorily as an electrolyte for refining lead. It conducts the current well, is easily handled and stored, non-volatile and stable under electrolysis, may be made to contain a considerable amount of dissolved lead, and is easily prepared from inexpensive materials. It possesses, however, in common with other lead electrolytes, the defect of yielding a deposit of lead lacking in solidity, which grows in crystalline branches toward the anodes, causing short circuits. But if a reducing-action (practically accomplished by the addition of gelatine or glue) be given to the solution, a perfectly solid and dense deposit is obtained, having very nearly the same structure as electrolytically-deposited copper, and a specific gravity of about 11.36—that of cast-lead. 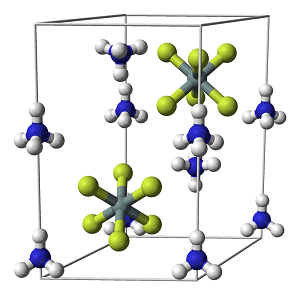 Lead-fluosilicate may be crystallized in very soluble, brilliant crystals, resembling those of lead-nitrate and containing four molecules of water of crystallization, with the formula PbSiF6,4H2O. This salt dissolves at 15° C. in 28 per cent, of its weight of water, making a sirupy solution of 2.38 sp. gr. Heated to 60° C., it melts in its water of crystallization. A neutral solution of lead-fluosilicate is partially decomposed on heating, with the formation of a basic insoluble salt and free fluosilicic acid, which keeps the rest of the salt in solution. This decomposition ends when the solution contains, perhaps, 2 per cent, of free acid; and the solution may then be evaporated without further decomposition. The solutions desired for refining are not liable to this decomposition, since they contain much more than 2 per cent, of free acid. The electrical conductivity depends mainly on the acidity of the solution. My first experiments were carried out without the addition of gelatine to the fluosilicate solution. 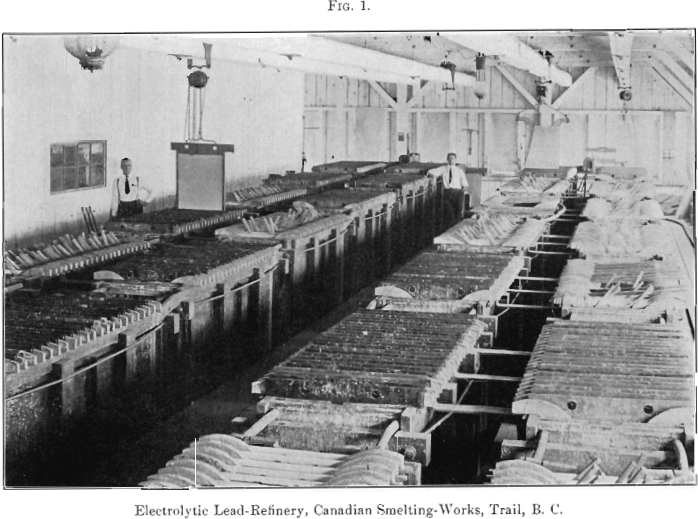 The lead-deposit consisted of more or less separate crystals that grew toward the anode, and, finally, caused short-circuits., The cathodes, which were sheet-iron plates, lead-plated and paraffined, had to be removed periodically from the tanks and passed through rolls, to pack down the lead. When gelatine has been added in small quantities, the density of the lead is greater than can be produced by rolling the crystalline deposit, unless great pressure is used. The Canadian Smelting-Works, Trail, British Columbia, have installed a refinery, making use of this process. There are 28 refining-tanks, each 86 in. long, 30 in. wide and 42 in. deep, and each receiving 22 anodes of lead-bullion with an area of 26 by 33 in. exposed to the electrolyte on each side, and 23 cathodes of sheet-lead, about 1/16 in. thick, prepared by deposition on lead-plated and paraffined-iron cathodes. The cathodes are suspended from 0.5 by 1 in. copper-bars, resting crosswise on the sides of the tanks. The experiment has been thoroughly tried, of using iron-sheets to receive a deposit thicker than 1/16 in. 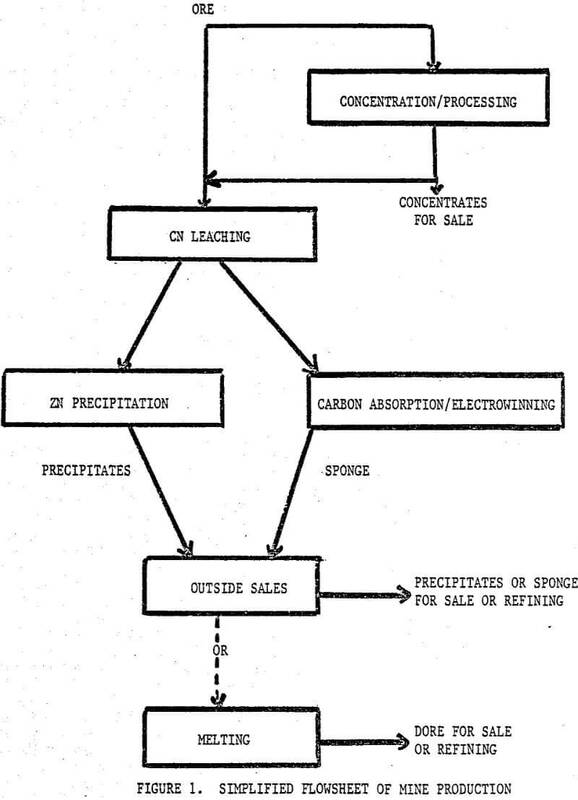 ; that is, suitable for direct melting without the necessity of increasing its weight by further deposition as an independent cathode; but the iron-sheets are expensive, and are slowly pitted by the action of the acid-solution; and the lead-deposits thus obtained are much less smooth and pure than those on lead-sheets. The smoothness and the purity of the deposited lead are proportional. Most of the impurity seems to be introduced mechanically through the attachment of floating particles of slime to irregularities on the cathodes. The effect of roughness is cumulative : it is often observed that particles of slime attract an undue amount of current, resulting in the lumps seen on the cathodes. Samples taken at the same time showed from 1 to 2.5 oz. silver per ton in rough pieces from the iron cathodes, 0.25 oz. as an average for the lead-sheet cathodes, and only 0.04 oz. in samples selected for their smoothness. 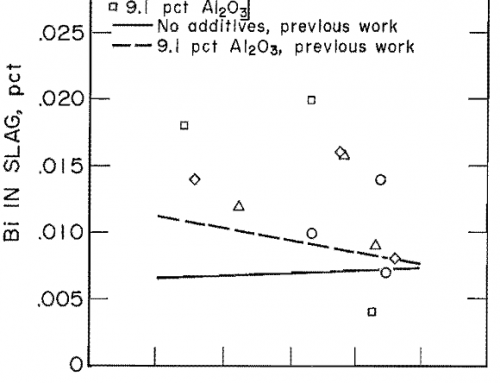 The variation in the amount of silver (which is determined frequently) in the samples of refined-lead is attributed not to the greater or less turbidity of the electrolyte at different times, but to the employment of new men in the refinery, who require some experience before they remove cathodes without detaching some slime from the neighboring anodes. 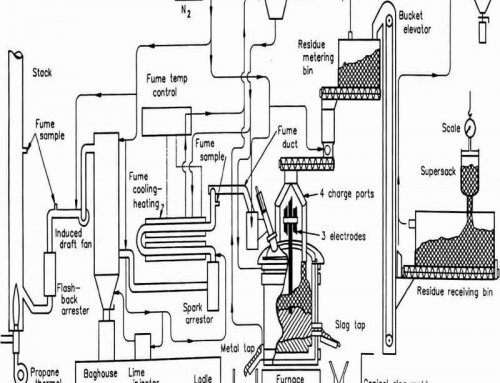 The shape of the electrodes, and the method of handling them to and from the tanks, are shown in Fig. 1. Each tank is capable of yielding, with a current of 4,000 amperes, 750 lb. 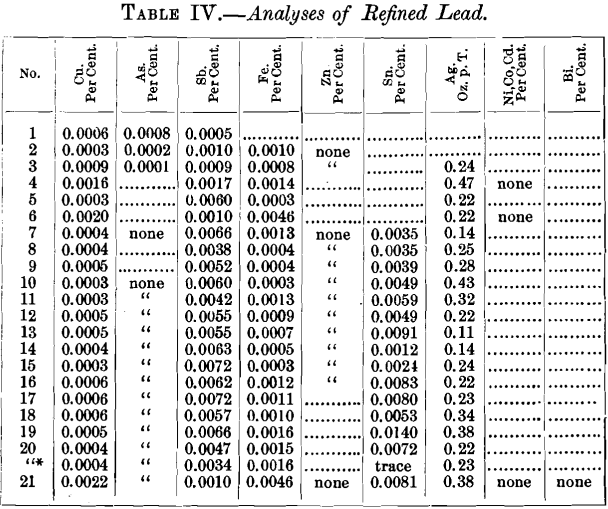 of refined-lead per day. The voltage required to pass this current was higher than expected, as explained below ; and for this reason, and also because the losses of solution were very heavy until proper apparatus was put in to wash thoroughly the large volume of slime produced (resulting in a weakened electrolyte), the current used has probably averaged about 3,000 amperes. The short-circuits were also troublesome, though this difficulty has been greatly reduced by frequent inspection and careful placing of the electrodes. At one time, the solution in use had the following composition in grammes per 100 c.c. : Pb, 6.07; Sb, 0.0192; Fe, 0.2490; SiF6, 6.93, and As, a trace. The current passing was 2,800 amperes, with an average of about 0.44 volts per tank, including bus-bars and contacts. It is not known what was the loss of efficiency on that date, due to short-circuits; and it is, therefore, impossible to say what resistance this electrolyte constituted. 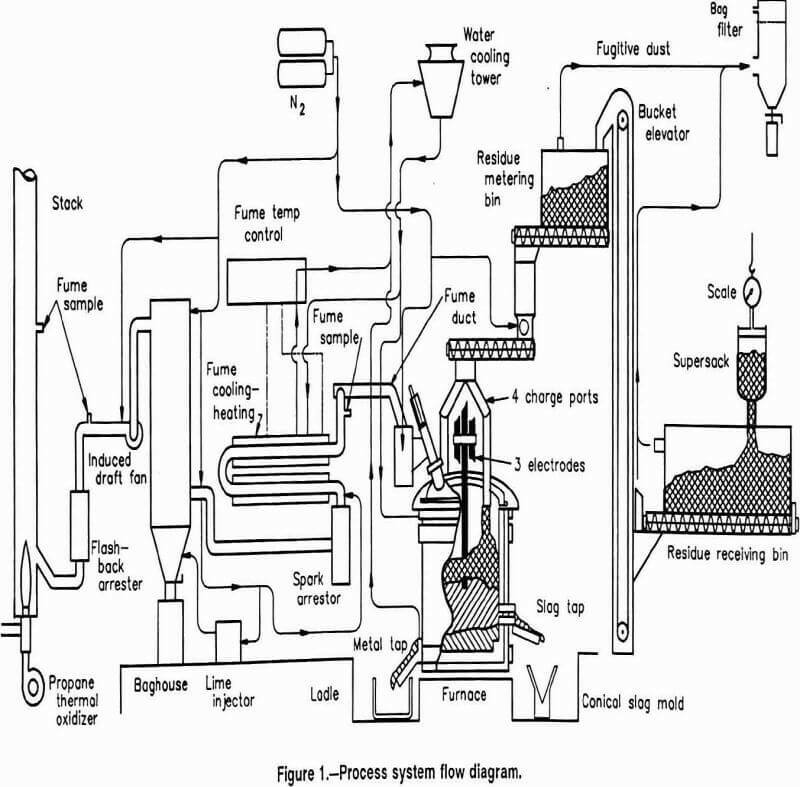 Hydrofluoric acid of 35 per cent., used as a starting-material for the preparation of the electrolyte, is run by gravity through a series of tanks for conversion into lead-fluosilicate. In the top tank is a layer of quartz 2 ft. thick, in passing through which the hydrofluoric acid dissolves silica, forming fluosilicic acid. White-lead (lead-carbonate) in the required quantity is added in the next tank, where it dissolves readily and completely with effervescence. All sulphuric acid and any hydrofluoric acid that may not have reacted with silica settle out in combination with lead as lead-sulphate and lead-fluoride. Lead- fluosilicate is one of the most soluble of salts; so there is never any danger of its crystallizing out at any degree of concentration possible under this method. The lead-solution is then filtered and run by gravity into the refining-tanks. The solution originally used at Trail contained about 6 per cent. Pb and 15 per cent. SiF6. The electrical resistance in the tanks was found to be greater than had been calculated for the same solution, plus an allowance for loss of voltage in the contacts and conductors. This is partly, at least, due to the resistance to free motion of the electrolyte, in the neighborhood of the anode, offered by a layer of slime which may be anything up to 0.5 in. thick. During electrolysis, the SiF6 ions travel toward the anodes, and there combine with lead. 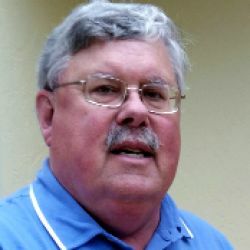 The lead and hydrogen travel in the opposite direction and out of the slime; but there are comparatively few lead ions present, so that the solution in the neighborhood of the anodes must increase in concentration and tend to become neutral. This greater concentration causes an E. M. F. of polarization to act against the E. M. F. of the dynamo. This amounted to about 0.02 v. for each tank. The greater effect comes from the greater resistance of the neutral solution with which the slime is saturated. There is, consequently, an advantage in working with rather thin anodes, when the bullion is impure enough to leave slime sticking to the plates. A compensating advantage is found in the increased ease of removing the slime with the anodes, and wiping it off the scrap in special tanks, instead of emptying the tanks and cleaning out, as is done in copper-refineries. It is very necessary to have adequate apparatus for washing solution out of the slime. The filter first used consisted of a supported filtering-cloth with suction underneath. It was very difficult to get this to do satisfactory work by reason of the large amount of fluosilicate to be washed out with only a limited amount of water. At the present time the slime is first stirred up with the ordinary electrolyte several times, and allowed to settle, before starting to wash with water at all. The Trail plant produces daily 8 or 10 cu. ft. of anode residue, of which over 90 per cent, by volume is solution. The evaporation from the total tank-surface of something like 400 sq. ft. is only about 15 cu. ft. daily; so that only a limited amount of wash-water is to be used—namely, enough to replace the evaporated water, plus the volume of the slime taken out. The tanks are made of 2-in. cedar, bolted together and thoroughly painted with rubber-paint. Any leaks are caught underneath on sloping-boards. 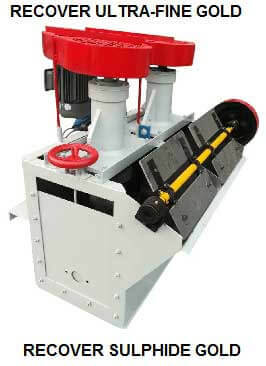 Solution is circulated from one tank to another by gravity, and is pumped from the lowest to the highest by means of a wooden pump. The 22 anodes in each tank together weigh about 3 tons, and dissolve in from 8 to 10 days, two sets of cathodes usually being used with each set of anodes. While 300-lb. cathodes can be made, the short-circuiting gets so troublesome with the spacing used that the loss of capacity is more disadvantageous than the extra work of putting in and taking out more plates. The lead-sheets used for cathodes are made by depositing about 1/16- in. metal on paraffined steel-sheets in four of the tanks, which are different from the others only in being a little deeper. The anodes may contain any or all of the elements, gold, silver, copper, tin, antimony, arsenic, bismuth, cadmium, zinc, iron, nickel, cobalt and sulphur. It would be expected that gold, silver, copper, antimony, arsenic and bismuth, being more electronegative than lead, would remain in the slime in the metallic state, with, perhaps, tin, while iron, zinc, nickel and cobalt would dissolve. 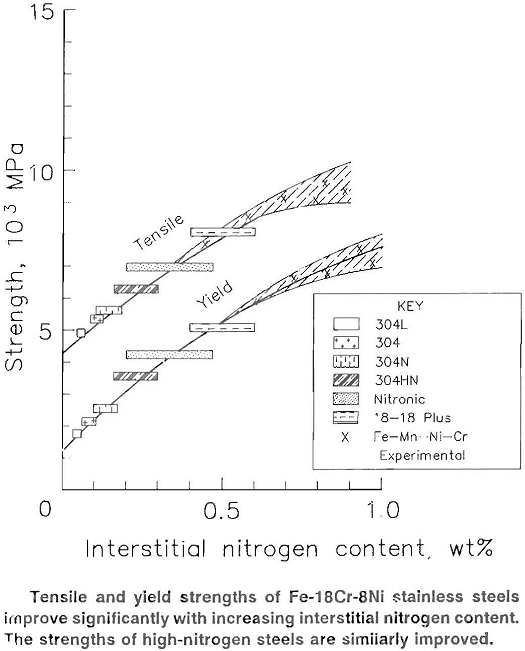 It appears that tin stands in the same relation to lead that nickel does to iron, that is, they have about the same electromotive forces of solution, with the consequence that they can behave as one metal and dissolve and deposit together. Iron, contrary to expectation, dissolves only slightly, while the slime will carry about 1 per cent, of it. It appears from this that the iron exists in the lead in the form of matte. Arsenic, antimony, bismuth, and copper have electromotive forces of solution more than 0.3 volt below that of lead. As there is no chance that any particle of one of these impurities will have an electric potential of 0.3 volt above that of the lead with which it is in metallic contact, there is no chance that they will be dissolved by the action of the current. The same is even more certainly true of silver and gold. The behavior of bismuth is interesting and satisfactory. It is as completely removed by this process of refining as antimony is. No other process of refining lead will remove this objectionable impurity so completely. 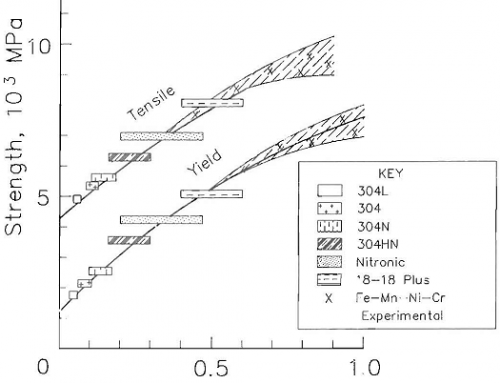 Tin has been found in the refined-lead to the extent of 0.02 per cent. This we had no difficulty in removing from the lead by poling before casting. There is always a certain amount of dross formed in melting down the cathodes; and the lead-oxide of this reacts with the tin in the lead at a comparatively low temperature. The extra amount of dross formed in poling is small, and amounts to less than 1 per cent, of the lead. The dross carries more antimony and arsenic than the lead, as well as all the tin. The total amount of dross formed is about 4 per cent. Table I. shows its composition. The electrolyte takes up no impurities, except, possibly, a small part of the iron and zinc. Estimating that the anodes contain 0.01 per cent, of zinc and soluble iron, and that there are 150 cu. ft. of the solution in the refinery for every ton of lead turned out daily, in one year the 150 cu. ft. will have taken up 72 lb. of iron and zinc, or about 1 per cent. These impurities can accumulate to a much greater extent than this before their presence will become objectionable. It is possible to purify the electrolyte in several ways. For example, the lead can be removed by precipitation with sulphuric acid, and the fluosilicic acid precipitated with salt as sodium fluosilicate. By distillation with sulphuric acid the fluosilicic acid could be recovered, this process, theoretically, requiring but one-third as much sulphuric acid as the decomposition of fluorspar, in which the fluorine was originally contained. The only danger of lead-poisoning to which the workmen are exposed occurs in melting the lead and casting it. In this respect the electrolytic process presents a distinct sanitary advance. For the treatment of slime, the only method in general use consists in suspending the slime in a solution capable of dissolving the impurities and supplying, by a jet of steam and air forced into the solution, the air necessary for its reaction with, and solution of, such an inactive metal as copper. After the impurities have been mostly dissolved, the slime is filtered off, dried and melted, under such fluxes as soda, to a dore bullion. The amount of power required is calculated thus: Five amperes in 24 hours make 1 lb. of lead per tank. One ton of lead equals 10,000 ampere-days, and at 0.35 volts per tank, 3,500 watt-days, or 4.7 E.H.P.-days. Allowing 10 per cent, loss of efficiency in the tanks (we always get less lead than the current which is passing would indicate), and of 8 per cent, loss in the generator increases this to about 5.6 H.P.-days, and a further allowance for the electric-lights and other applications gives from 7 to 8 H.P.-days as about the amount per ton of lead. At $80 per year, this item of cost is something like 65 cents per ton of lead. 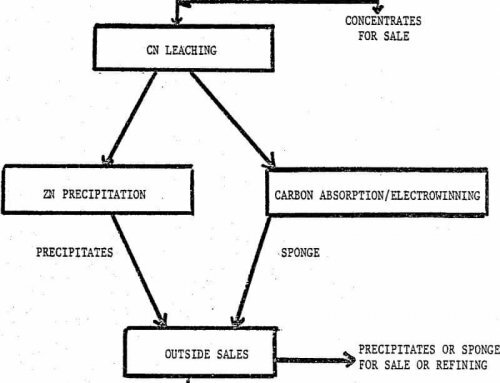 So this is an electrochemical process not especially favored by water-power. 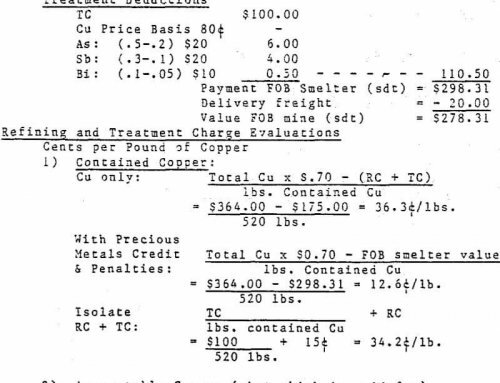 The cost of labor is not greater than in the zinc-desilverization process. 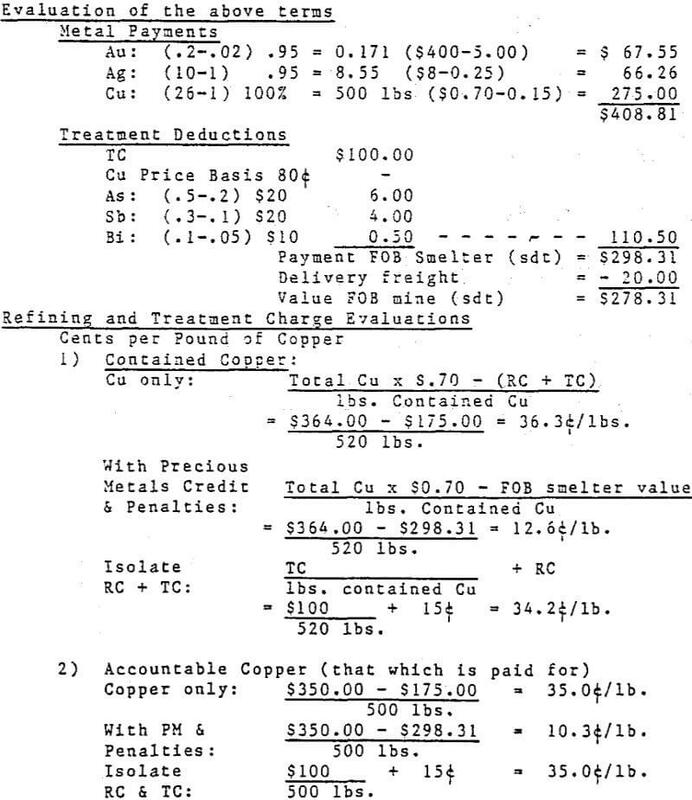 A comparison between this process and the Parkes process, on the assumption that the costs for labor, interest and general expenses are about equal, shows that about $1 worth of zinc and a considerable amount of coal and coke have been done away with, at the expense of power, equal to about 175 H.P.-hours., of the average value of perhaps 65 cents, and a small amount of coal for melting the lead in the electrolytic method. More important, however, is the greater saving of the metal-values by reason of increased yields of gold, silver, lead, antimony and bismuth, and the freedom of the refined-lead from bismuth. Tables II., III. and IV. 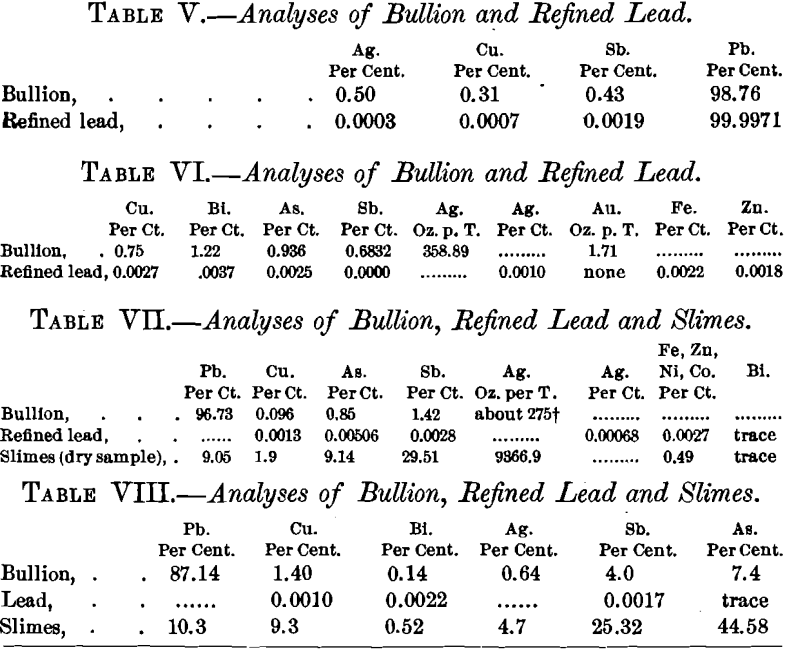 show the composition of bullion, slimes and refined lead. Tables V., VI., VII. and VIII. give the results obtained experimentally in the laboratory on lots of a few pounds up to a few hundred pounds. The results in Tables VI. and VII. were given me by the companies for which the experiments were made. The process here described, has been patented in the United States, Canada, Mexico, Belgium, France, Great Britain, Italy, Spain, Hew South Wales, Victoria and South Australia. The success thus attained in the electrolysis of lead, generally accepted hitherto as impracticable, may give some encouragement to the employment of similar methods in the treatment of some of the other metals, especially as it is shown to be possible to apply simple means to obviate the chief trouble, spongy deposits.